On the night of Tuesday 22 February 1881, a fierce gale blew the brigantine Isabel off course as she neared her destination. She had been bound from Maceo, Brazil, in ballast, for St John's in Newfoundland. Instead of continuing up the eastern coast of the island, the little vessel was blown westwards and up into St Mary's Bay, and after battling against winds, and ice, and in the blackest of nights, was dashed against the rocks at Gull Island Point near Peter's River. A week went by before the story of the shipwreck began to hit the press. Meanwhile debris began to get washed ashore in the cove at Gull Island Point. First came the figurehead, and several water buckets, evidence of the desperate fight against rising water. Then some of the crew's clothing, and then a flag bearing the name "Isabel". The brigantine's owners, Job Brothers of St John's Newfoundland, were informed on Saturday 26 February that the vessel was lost with all hands, and on Tuesday 1 March, a full week after that fateful storm in which the whole crew lost their lives, the story started being reported in newspapers around the English-speaking world, with as many details of the the crew, the Isabel and the voyage as could be found. Which at first wasn't an awful lot of detail. 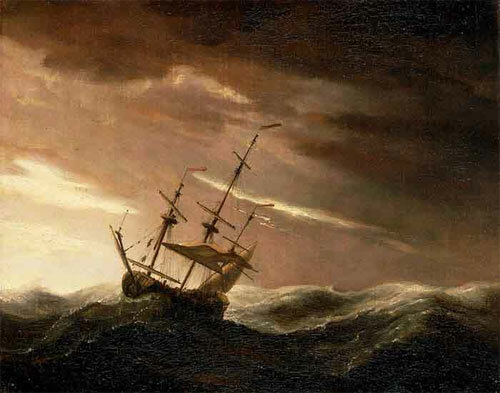 On 3rd March the Morning Chronicle reported "A letter from St Mary's Bay gives us no further information in the matter of the loss of the brigantine Isabel ... Constable Collins visited the place shortly after the catastrophe but our correspondent regrets to say 'found no trace of the crew or their bodies.' He found however, some clothes which were very much the worse for the usage they had received, and which gave no indication of whom they belonged to." But Job Bros was getting trouble from another quarter at the same time. "A cablegram from St John's reports that the Isabel, from Pernambuco for St John's, is supposed to have been lost at Cape St Mary's." That was on 1 March. The family was incensed that the story could be reported in the papers before any attempt was made to notify the next of kin. It was with deep sorrow we were obliged to convey to you 2 days ago thro' Maj Glynn [your intimation?] of "Isabel" loss with all hands on the Newfld Coast. We have no particulars except what we hear by cable as follows. "Isabel with all hands total loss Peter's River Tuesday". During the time your late husband has been with us he has given us entire satisfaction, and we heartily sympathize with yourself and other members of his family in your bereavement. PS Since writing above your note of y.day has come in and we are grieved to hear that the first intimation of Isabel's loss reached you thro' the newspaper. Our friend Maj. Glynn thro' whom we engaged your husband undertook thro' mutual friends to break the news to you or we should have written you at once ourselves. JB"
Nor is it known who the unfortunate Major Glynn was. After Thomas Stamp's trip to St Mary's with the grim news of the finding of the first body, there was another little flurry of press interest.